Join Daniela on Wednesdays, April 10, 17 & 24 from 2 – 4pm. $85 plus materials. 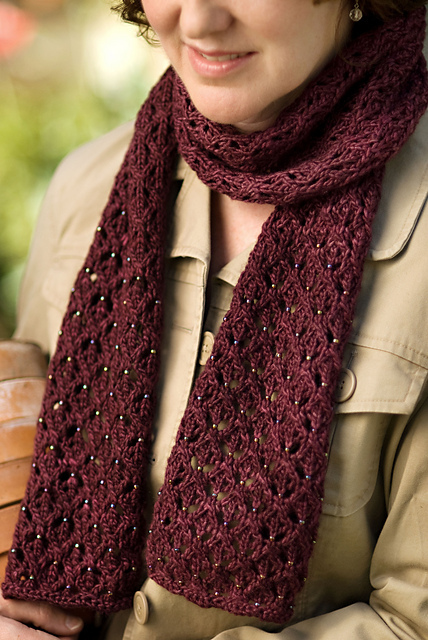 It’s springtime, the perfect season to make a light breezy scarf with this simple but lovely stitch pattern. A four+four-row repeat and easy-to-see centered stitch alignments make this the perfect pattern for learning to ‘read’ your knitting. And, to “gild the lily”, we will be adding beads! This class will cover different methods of beading and get you comfortable with simple lace knitting.